I was reading some stories on line and came across this story about a Dutch pastor and his family who had been hiding Jewish people in their home during the second World War. One night, they heard the sound of heavy boots and the loud impatient knocking on the door. They were arrested and loaded into a cattle car. All night long, the pastor and his family rode along in anguish, knowing they were being taken to one of Hitler's concentration camps only to be separated from each other and likely killed. Finally, the the train stopped. The doors of the cattle car were opened. They were marched out and lined up beside the railroad tracks. But then something very strange happened. 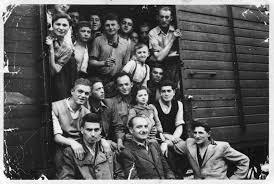 They discovered that they were not in a death camp at all -- they weren't even in Germany! Dear Lord, we want to thank You for the incredible gift that You gave us. Help u snot keep it to our self but instead pass it alone to everyone You bring into our path. In the Name of Jesus, Amen.